B&O BeoSound 5 review | What Hi-Fi? There's no doubting the visual impact of Bang & Olufsen's new BeoSound 5 digital music player: as a thing to look at and use, it's quite delightful. The only problem for some buyers might lie in working out what it actually is. It comes in two boxes: the first, the BeoMaster 5, is a 500GB hard-disk with network access and suitable connections to B&O's range of active speakers: the second is the BeoSound 5 controller, shown here. The BeoMaster 5 doesn't include any disc-ripping drive of its own: instead, it connects to your PC or Mac via wired Ethernet, then uses some supplied software to transfer your music from whatever you're currently using (say, iTunes) into its capacious hard-disk. A broad range of digital music file types is supported, including high-quality options like WAV and WMA lossless, and B&O reckons it'll handle up to 1000 CDs in best-quality form, rising to a maximum of 6000 CDs in 196kbps MP3. It'll support internet radio, photo storage and even certain video formats if you wish. If the BeoMaster 5 is the brains of the operation, then the BeoSound 5 controller is certainly the looker. 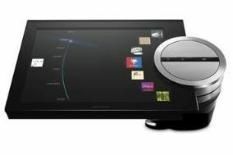 A gorgeous 10.4in, 1024 x 768 resolution controller, it uses a deliciously heavy and tactile-feeling aluminium control wheel mounted to the side of the unit instead of a touch-panel interface. This design approach has two advantages: first, it makes the business of searching through your music an amazingly enjoyable, hands-on affair, aided by B&O's clever MOTS (More Of The Same) software, which helps create intelligent playlists automatically. Second, the system allows for an especially sharp, high-quality screen. In action, the B&O always sounds good and occasionally great, although as with all such devices, sound quality depends on the file types in which you choose to store your music. Linked into a pair of BeoLab 9 speakers, WAV and Lossless files naturally worked best: here, the sound is at once assured and impressively 'hi-fi', and has little truck with the high-frequency hardness that can plague many digital music systems. Summarising a system like this isn't easy: you could rival its sound with a more conventional hi-fi set-up. But would that look so good, be so lovely to use, and generally leave you with such a warm glow every time you used it?